If you are a Hindi movie buff, you ought to remember ‘Circuit’ from the Munna Bhai series or ‘Baburao Ganpat Rao Apte’ from the Hera Pheri series. How can you not remember the famous ‘Amar – Prem’ from cult comedy Andaz Apna Apna or Tushar Kapoor’s mute comedy in the blockbuster Golmaal franchise! These are characters that are synonymous with the film they star in. One cannot envision any other actor playing these aforementioned roles. Not only have these said actors gained tremendous appreciation for these roles, but also in a large identifiable by these characters and films. The same can also be associated with television space as well. ‘Tulsi Virani’ as a character is till date associated with Indian soap-opera ‘Kyun ki Saas Bhi Kabhi Bahu Thi’ and so is Prerna Bajaj from Kasauti Zindagi Ki. There was a time when these names and characters ruled television space and were household names. In the recent times, we have seen such roaring popularity been gained by a male who plays a female – yes you’re guessing it right; its stand-up comedian Sunil Grover who played the wacky but lovable Gutthi on 'Comedy Nights with Kapil'. But the last few weeks have been overflowing the media space with rumours, assumptions, cross allegations, confirmations..!! 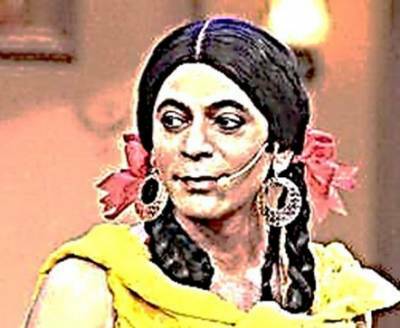 As Adgully reported earlier, Grover’s exit from the satirical show Comedy Nights and the rumours that followed the event, the channel had publically issued a legal notice in a publication claiming copyrights on Grover’s character – Gutthi and threatening legal action against anyone who copies it. While we know that Gutthi along with the characters mentioned above are intellectual properties, the ‘Gutthi’ fiasco has raised certain unexplored questions as to whose IPR is it – the writer who sketches the character on paper, or the actor who play and portrays the character, or the producer who signs the actor to play the role, or the director who bring the character to us through his lens or the channel who airs the show? While a ‘Circuit’ propelled actor Arshad Warsi’s career, does IPR which in his case might be the writer or producer; limit him from performing the character on any other platform? Similarly, is Grover - Gutthi not allowed to perform on any platform? Also, do the nuances of these characters belong ONLY with the individual or body holding the IPR for the character? In today’s Adgully Perspective, we ask people from the business as to whose IPR are these landmark characters, especially Gutthi. Also, does ‘not holding the IPR’ restrict the actor from performing the character elsewhere? Here is what we got to know. Deeya Singh, Producer, DJ's A Creative Unit said, “One thing to understand here is, ‘an actor reaches out to masses, production house and studios create the character and concept whereas channel broadcasts it’. When we talk who's property is a specific character, it's all depend upon process of creation; if a person has innovated something by his own, it's certainly his right. A person will fight for his/her right only when he is confident and believes that he has done something above the line.” She believes that the production house and actor both are equally responsible for the show. “If a producer is missing from the set doesn't affect the show much until actor is not present on the set. Though we can replace the actors for certain characters, but it is challenging part”. Saurabh Tewari, Producer, Nautanki Telefilms said, "I think in this all three have the right. As when production house wouldn't have conceived it, it would have never got created. If actor wouldn't have played it with perfection, it would have never become popular and if broadcaster would have not telecast it no one would have known that such character existed. In case of dispute, ideally no single party should claim." belongs to the producers and not the actors personally. “Ultimately it is the producer who gives birth to various aspects of a show which include not only a particular character, but also other specifications like art, design etc, which all comes under the producer’s umbrella. Though these issues can be resolved mutually, but on the legal grounds the IPR rest with the producers”. Like Grover, another actor who gained success through comedy based shows, actor and comedian Sunil Pal, said, "I think when we see a character on television, it's through the artist who is performing it. And when an artist brings a specific character by his own, then it’s his right on that character, but if a creative team and production house has provided a specific theme or character to artist, only then do they have right to patent it." power is with the broadcaster and its them who need to take lead in the deciding as to how to draw up plans to hold back the ‘good actors’ they have brought on board. He said that possibly a better remuneration offered would not tempt a writer or an artist or any other team member to hunt for other houses to work with. He also, goes on to say, “Also, with so many rumours around the issue, I am also, assuming that it’s not only the remuneration aspect, but intangibilities like ‘ego’ of the actors has also got a role to play in this tiff. On moral and ethical grounds, though the exit means more power to the talent, it also in a way means certain disrespect to the platform that gave the actor a conducive environment to perform and gain success”. He also said that ‘not holding’ the IPR should not stop the actor from performing. Though at the behest of the channel he gained success, but if he has quit, he ought to prove his mettle by doing something really brilliant. Sukesh Motwani, Independent Channel Consultant and Producer said, “The incident has in a way forced people from the industry and the fraternities involved in the issue – the actors, producers and the channel to again strengthen their perspective and norms as to how talent, ideas and creativity should be copyrighted and correctly compensated”. We at Adgully, just like other viewers await the final decision on whose Gutthi is she anyway!